Amuse-bouche? Palate-tickler? Mise en bouche? Mouth-entertainer? Or how about chef’s greeting, “appeteaser,” mouth-pleaser, or pre-appetizer? Whatever you call it, the tiny bite you’ll eat at the beginning of a meal is usually found only in gastronomic restaurants. But why not chez toi? Read on to find out how. You might also hear that colorful phrase in Mathieu Kassovitz’s movie La haine. Shortly after the movie was released in 1995, I was teaching college-level French to American students, and we watched the movie together. One student approached me after the screening, and I asked him if he liked it. He screwed up his face in indecision, answering, “I’m not sure… I guess it was a little too…. too thought-provoking or something.” God forbid we provoke thought in a French class! So gueule isn’t appropriate language for fine restaurants, but if you go to them regularly, you’re probably a fine gueule, or a gourmet. If you partake in a side-splitting laugh, in French we’d say se fendre la gueule. And someone who makes a funny face? Faire une drôle de gueule. Which is precisely the face the guy from my class was making after watching La haine. But back to the amuses: officially, an amuse-bouche is a bite-size hors d’oeuvre – I’ll be coming back to the hors d’oeuvre’s long history in a future post – served before the starter or appetizer. It’s not on the menu, so the chef decides what’s in it. The amuse prepares you for the meal to come because it allows you to sample the chef’s personal aesthetic, like an introduction to the rest, or the chef’s greeting. The advantages of the amuse-bouche for a restaurateur are clear: since they’re offered for free, they help promote customer loyalty – we all feel special when we get a gift from the chef! For the chef, the amuse is a way to show off fresh ingredients from the market that may be sold in small quantities, or on the other hand, to use up small quantities of ingredients s/he might already have on hand. But if you want to make amuses-bouche at home, how can you master this art? Here are a few advantages and tips. 1)	Amuses-bouche are great for expressing creativity and setting up a sense of luxury, without the price tag. They’re like a little sketch pad, in the words of journalist Andy Battaglia. Amuses don’t cost much, so if you’re considering cooking with an expensive ingredient like foie gras or truffles, amuses are perfect for testing your techniques on a small scale. 2)	Do you know why the kitchen staff likes amuses? They’re time savers. Chefs prepare amuses-bouche in advance and use them strategically to keep diners happy while they’re preparing the starters/appetizers. You can do the same at home if you make them ahead. 3)	Amuses are an excellent way to introduce unusual foods to guests (think sweetbreads or sea urchin). 4)	So many “palettes” are available: crackers, toast points, shot glasses or other small cups or glasses, egg cups, Chinese-style spoons, or skewers. How about the foods themselves? In summer, you can use vegetables cut into cylinders and hollowed out into cup shapes (like zucchini) or a single fingerling potato half, to “hold” other foods. 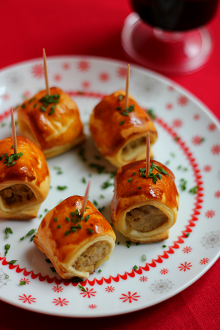 In cooler seasons, puff pastry works well wrapped around boudin blanc, for example, or the traditional bacon-wrapped…anything! 5)	Looking for specific ideas? Underneath my Cool as a cucumber recipe below, you’ll find links for all sorts of inspiration. Happy amusing! When I was living with my first French roommate, both of us happened to be reading Henry Miller’s Tropic of Cancer. My version was in English, hers was in French, and we enjoyed comparing the translation to the original. One day, my roommate asked me, “What is this expression, frais comme un concombre?” I laughed and described the term – someone who’s relaxed, laid-back, or in unofficial French: cool. This smooth, pale-green soup is flecked with dill, and it’s just a little racy with garlic. 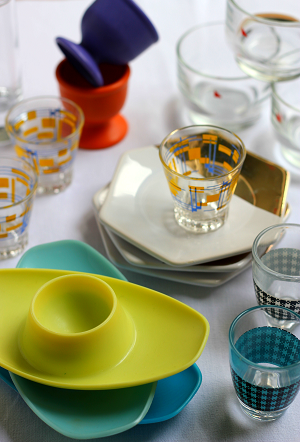 It’s served cold, and it’s a great way to start a cool summer meal, either as a starter in any small decorative cup, or as an amuse-bouche in tiny shot-style glasses or verrines as shown here. Back when I still brought dishes over from the States, I would serve this in vintage Melmac Royale cups and saucers: the matte hues worked well as a contrast to the soup’s icy color. 1. Blanch the garlic clove – double-blanching “softens” the too-harsh flavor of fresh garlic in the smooth soup. In a small casserole filled about halfway up with cold water, bring the two garlic halves to a boil. Strain immediately, and repeat this process. Cool the garlic by running it under cold water, and chop coarsely. 2. Thinly slice 5 rounds of cucumber from the middle of one of them, and reserve. Slice the rest of the cucumber in two lengthwise, and scoop out the seeds using a spoon. Then chop the cucumbers into thumbnail-size cubes. 3. Combine the garlic, cucumber, yogurt, and cream in the cup you use with your wand mixer, or in the bowl of a blender or food processor. Purée until smooth. 4. Add salt, pepper, and chopped dill, and stir to combine. Chill for 2 hours, and serve in small soup cups or in small (2-ounce) shot-size glasses. 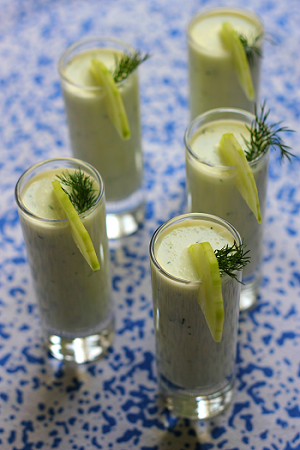 Decorate with half-rounds of cucumber or lemon and a sprig of dill, and a splash of lemon juice at the table. For inspiration, this quick Pinterest search, right, yielded no end of possibilities and options. You can find lots of ideas in this book by Rick Tramonto. If you’d like to have a look at some ideas in French for amuses-bouche, this web site has lots of fiches techniques, otherwise known as recipes! Thanks for reading, Alisa. So glad the article inspired you!